Post Mortem was produced in association with California Watch. Chris Reynolds vividly remembers his first encounter with the work of forensic pathologist Dr. Thomas Gill. It was 2001. Reynolds, a Santa Rosa private investigator, was hired by a Sonoma County man accused of killing his wife. Gill, who conducted the wife's autopsy, was the prosecution's key witness, having determined the death was a "textbook" case of suffocation. Reynolds' client's prospects looked grim. But when Reynolds dug into Gill's background, he unspooled a history in which Gill landed post after post despite a lengthening trail of errors and, in one instance, drinking on the job. Gill had been forced out of a teaching position at an Oregon university, and then fired for inaccurate findings and alcohol abuse by the coroner in Indianapolis, Reynolds discovered. Demoted for poor performance as a fellow for the Los Angeles County Coroner, he resurfaced at a private autopsy company in Northern California. Reynolds learned that Gill had missed key evidence in the Sonoma County case and that he had been coached by prosecutors to downplay his past, prompting the dismissal of the murder charge. Yet, in the decade since, Gill has continued to do thousands of autopsies and to serve as an expert witness in criminal cases. He landed a job as the No. 2 forensic pathologist in Kansas City, Mo., where his work again drew fire, and then returned to Forensic Medical Group Inc., the Fairfield firm that handled the case investigated by Reynolds. The private forensics firm has held contracts with 16 Northern California counties to perform autopsies for local agencies. Besides Sonoma County, Gill has conducted death investigations or testified in court cases in Contra Costa, Solano, Marin, Napa, Sutter, Lake and Humboldt counties as a doctor for Forensic Medical Group. He had done more than 800 autopsies during a three-year period in Yolo, Napa and Solano counties alone. Forensic Medical Group cut its ties with Gill in December after Yolo County Sheriff-Coroner's officials learned of the doctor's history from reporters and barred him from performing its autopsies. In a written response to questions, Forensic Medical Group said that after Yolo County's decision, it no longer had enough cases to justify employing Gill. Gill's ability to resurrect his career time and again reflects a profound weakness at the center of the U.S. system of death investigation. A chronic shortage of qualified forensic pathologists allows even questionably competent practitioners to remain employable. The absence of trained practitioners is so acute that many jurisdictions don't look closely at the doctors they employ. Some of the officials who hired Gill acknowledged they knew about his problems but said they had no other viable options. With no national oversight of forensic pathologists or standards that dictate who can do autopsy work, there is nothing to prevent Gill from resuming his career. In some cases, officials in charge of death investigation are more concerned with costs than with competent autopsies, said Dr. John Pless, a director of the National Association of Medical Examiners and retired forensic pathology professor at Indiana University. "What the problem is all over and why Tom Gill is accepted is there are people running the system who don't understand the complexity of the medical determinations," Pless said. Although the California State Bar deemed him incompetent in a 2006 report on the Sonoma case, Gill ruled on more than 1,000 death investigations in eight California counties from 2007 to 2010. Gill, 67, initially declined requests for interviews for this story. Approached by a reporter at his Fairfield home in December, he would not address specific cases or criticism of his work. "I am a qualified forensic pathologist, and I have testified on numerous occasions," Gill said. Later, in a written statement, Gill acknowledged that when he joined the Indianapolis coroner's office, "I had no formal training in forensic pathology and therefore made mistakes, particularly in pediatric cases where findings tend to be more subtle and complex." Dr. Arnold Josselson, Forensic Medical Group's vice president, said he had seen Gill's work firsthand and trusted him. "I've observed him doing autopsies, and I think he's competent," Josselson said. When Gill started work at the Marion County Coroner's Office in Indiana on New Year's Day in 1993, he had performed only about 20 forensic autopsies since graduating from medical school 24 years earlier. Certified specialists in forensic pathology, the science of unexplained deaths, have completed medical school and a four-year residency in pathology, plus an additional year of intensive training and autopsy work. According to the National Academy of Sciences, there are roughly 500 such practitioners nationwide, less than half the number needed to properly investigate suspicious or unattended deaths. Gill, a neuropathologist by specialty, had spent the first two decades of his career teaching medical students at the Oregon Health & Science University and analyzing brain tissue for a nearby Veterans Affairs hospital. But Gill has acknowledged during preparation for court testimony that he was stripped of his teaching duties in 1992, possibly due to a drinking problem that dated back to the mid-'80s. Gill gave written answers to nearly 200 questions that prosecutors anticipated defense attorneys would ask during a 2001 homicide trial. One inquired whether his drinking had affected his work in Oregon. "Probably," Gill wrote in response, "but no documentation." At the time, the Marion County coroner, who serves the Indianapolis metropolitan area was desperate for help. Left without autopsy services after a contract dispute, the office had bodies stacked up in its refrigeration units. Gill worked seven days a week during his first several months in Indianapolis, examining four to eight bodies per shift, court and county records show. Signed to a four-year contract that paid $100,000 annually, he performed about 650 autopsies in 1993 alone, more than twice the maximum workload recommended by the National Association of Medical Examiners. It didn't take long for problems to surface with the accuracy and precision of his work. In early 1993, Gill ruled that Dylan Petroff, a 17-month-old boy, had died from a blood infection. A second autopsy conducted by a leading specialist hired by Petroff's parents, however, came to a different conclusion. Petroff had strangled, the specialist determined, caught in the slats of a defective crib at the uncertified day care center run by his babysitter. Pam Faught, Dylan's grandmother, said she was shocked that Gill continued to be entrusted with death investigations. "They don't tell the next person that's going to hire him how unqualified this individual really is," she said. "And he's got 'doctor' in front of his name." A year later, 6-month-old Julian Dorsey ended up on Gill's table. The doctor ruled the infant was a homicide victim, shaken to death by his father. But Gill's finding was reversed by his boss. There was no physical evidence that the child had sustained a brain injury. Gill's drinking also became an issue over the course of his tenure in Indianapolis. Soon after he started in Marion County, another coroner's office employee found him passed out drunk in a loading dock after the end of a shift, Gill acknowledged in written answers during preparation for a 2001 trial. On March 31, 1994, Gill arrived at a law office for a deposition in a homicide case. The prosecutor and court reporter later stated they smelled alcohol on his breath. Gill denied being drunk, but his sworn testimony on the shooting death of Cheryl Angleton repeatedly contradicted his autopsy findings. At one point, Gill speculated that his conclusion -- that Angleton had been murdered -- might have been wrong and that Angleton could have committed suicide. "Whatever credibility he may have had no longer exists," the prosecutor wrote in a report afterward, calling Gill's testimony "inaccurate, contradictory and absurd." Although an internal investigation officially cleared him of testifying drunk, Gill was told in July 1994 that his contract would end after just 19 months. "Your well documented inability to provide services at a reasonably necessary level has prevented you from establishing and maintaining credibility with the law enforcement community," Marion County Coroner Karl Manders wrote in his termination letter. Gill was given 30 days' notice but was unable to complete his final month. He was arrested on the charge of drunken driving on his way to the morgue one morning and barred from further work. He was convicted of the charge and Indiana's medical board suspended his license until he received substance abuse treatment. Gill moved to California and spent months undergoing treatment for alcohol abuse. Then, in early 1995, he landed a dream job: a one-year fellowship with the Los Angeles County Coroner, an ideal place to hone his training in forensic autopsies and death investigation. Gill did not disclose on his resume or application that he had been fired in Indianapolis. Los Angeles officials first caught wind of his troubles when a reporter from The Indianapolis Star called. "We were not knowledgeable, nor was this information voluntarily given to us," a coroner's office personnel administrator told the newspaper regarding Gill's mistakes in Marion County. Gill kept his post, even after his omissions were exposed, but struggled to meet the program's requirements. Nine months into his training, personnel records show, the coroner's office deemed his work deficient, cut his pay in half and demoted him to the equivalent of a medical student. In a written evaluation, Gill's superiors wrote "there are significant technical problems in some of your autopsies resulting in the need for continued supervision." Gill also was unable to complete the number of cases needed to finish the fellowship in a year, said Dr. James Ribe, a Los Angeles County deputy coroner and one of Gill's supervisors. The coroner's office gave Gill an additional six months to catch up. In 1997, with his fellowship completed, Gill was eligible to take the American Board of Pathology's certification exam for forensic pathology, the field's most universally recognized measure of competence. Nevertheless, Gill was hired in April 1998 by Forensic Medical Group, the for-profit autopsy company with contracts to handle cases for more than a dozen Northern California counties, including Sonoma County in the heart of one of the state's most renowned wine-producing regions. It was there that Reynolds, the private investigator, began to unravel Gill's past. 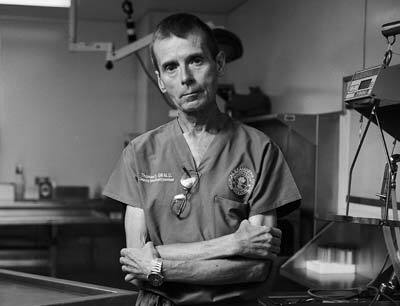 Late on the evening of Nov. 7, 1999, a prominent local physician in Petaluma, Calif., called 911. His wife was dead, Dr. Louis Pelfini told the emergency operator, adding that he feared she had committed suicide. The Sonoma County Sheriff's Office investigators who responded to the call did not initially treat Pelfini's home as a crime scene, police records show, but they ultimately came to suspect Pelfini had killed his wife, Janet. Gill started his examination of her body two days later. After a month, he ruled that Janet Pelfini had died from asphyxiation. His notes showed abrasions circling her mouth and a bruise on her forehead. Based on his findings, the sheriff's office classified her death as a homicide, and prosecutors filed murder charges against Louis Pelfini. Gill's certainty about what caused Janet Pelfini to suffocate prompted her husband's defense team to worry, said Reynolds, the private investigator hired by Louis Pelfini's attorney. But Gill's work on the case had some holes. Gill did not take pictures of Janet Pelfini's injuries as he autopsied her. He made drawings, but photographs from the scene taken by sheriff's deputies showed they were inaccurate. He failed to note a bruise on the back of her head on the drawings. In his written report, the injury was included, but on the wrong side of her head. Gill also overlooked mucus plugs in her lungs. Another pathologist, hired by the prosecution, later argued the plugs were evidence that Janet Pelfini had suffered a severe asthma attack shortly before her death, indicating she may have died from natural causes. Another limitation: The body had been cremated after Gill's autopsy, leaving other experts to argue over how to interpret his notes. With Pelfini's case resting primarily on Gill's conclusions, Reynolds began running the doctor's name through news archives and calling his former colleagues. When the defense team reported its findings about Gill to prosecutors, however, the state did not re-examine the charges. Instead, they secretly began coaching Gill, arranging for him to meet with a speech therapist to help craft his trial testimony. In the videotaped sessions, Gill acknowledged he would have to sidestep flaws in his casework. "There are deficiencies in the autopsy," he acknowledged. "You know we have kind of alluded to that." Practicing an answer to the question of why Marion County fired him, Gill said the termination was due to "errors in autopsies and inability to testify in trials." "OK, timeout," Harris interrupted. "Don't say … I would not say, 'My inability to testify in trials.' I would say, 'My difficulty in testifying effectively,' or 'my inability to effectively communicate the results of my autopsies.' Something to that effect." Gill is shown on the tape taking down Harris' instructions on a yellow notepad. "We always want to be thinking about, how do we counter these allegations, these innuendos that there's something wrong with you," Harris told Gill during one of the sessions. The strategy failed when Pelfini's attorney learned of the coaching sessions and the trial judge ordered the tapes released to the defense. Days later, the district attorney's office dropped all charges. The California State Bar investigated the handling of the Pelfini case and suspended the prosecutor from practicing law for four years for his role in suppressing evidence about Gill's coaching sessions. The bar report devoted several pages to Gill's errors. "Unfortunately," it concluded, "Dr. Gill was not a competent pathologist." The Pelfini case left Gill's reputation in Northern California tarnished. Sonoma County officials barred him from conducting autopsies there. As he had before, Gill sought a new start in a new state. In late 2002, the Jackson County Medical Examiner's Office, which handles autopsies for Kansas City, Mo., advertised for a deputy. The pickings were slim. "There were two applicants," said Dr. Thomas Young, then the office's sole forensic pathologist. "And the other one had already gotten into some ethical trouble back east, so he was just completely out." Young said he knew about the Pelfini case and about Gill's drunken driving conviction. But Young said he trusted what Gill told him: that the doctor had recovered from alcohol abuse and that the Sonoma County murder case collapsed due to prosecutorial misconduct, not poor autopsy work. Gill started work in Kansas City in November 2002, earning $140,000 a year. Young said he watched his colleague closely. "In terms of his conscientiousness, being thorough, he was good," Young said. "He did make some mistakes, but I caught them." In September 2003, Gill autopsied 23-year-old Robert Patterson, who had died a day after being injured in a car accident. Based on toxicology tests that showed painkillers in Patterson's blood, Gill ruled the death a suicide. But a second autopsy commissioned by Patterson's mother revealed an artery in Patterson's neck that showed signs of damage so severe it would have blocked blood flow to his brain. The injury almost certainly occurred in the car accident, the second pathologist concluded. 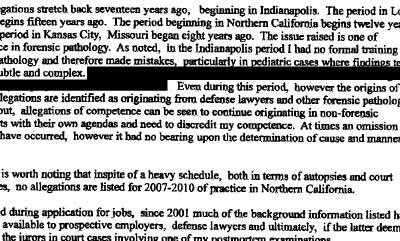 The following year, several Missouri prosecutors learned of Gill's problems in California and Indianapolis and threatened to boycott the Jackson County Medical Examiner's Office unless it fired Gill. Young refused. Asked why, he said the shortage of practitioners made the move impractical and that even the field's best sometimes misdiagnose causes of death. Gill stayed another two years, quitting at the end of 2006 after one of the prosecutors became the county's chief executive and after Young retired. Again, it didn't take long for him to find another job. In early 2007, Forensic Medical Group rehired Gill. Dr. Brian Peterson, who was the firm's president for 15 years before becoming Milwaukee's chief medical examiner, defended the decision. "To my mind, he was always a victim," Peterson said. "Gill's a great guy, and he's a fine pathologist." But the group didn't advertise Gill's background. On its website, it gave resumes and educational histories for all its doctors -- except Gill. In his written statement, Gill said his work since returning to Forensic Medical Group in 2007 had been above reproach. In addition, the doctor said that county officials in the jurisdictions he served were aware of his background. "In court and during application for jobs, since 2001 much of the background information has been made available to prospective employers, defense lawyers and ultimately, if the latter deemed it relevant to the jurors in court cases involving one of my postmortem examinations," Gill wrote. Presented with records detailing Gill's professional history in late November, officials with the Yolo County Sheriff-Coroner's Office expressed surprise. "This is an eye-opener for us, to admit humbly," said Yolo County Chief Deputy Coroner Robert LaBrash. Janna McClung, a Sutter County prosecutor, said neither she nor the sheriff-coroner's office were aware of Gill's background before being contacted by a reporter in December. Gill is scheduled to testify in a death penalty case being prosecuted by the district attorney's office. McClung said she had alerted the sheriff and the defendant's attorneys. "Obviously, what we're going to have to do is have another forensic pathologist look at our case as a follow up to him," she said. Until December, when Forensic Medical Group says it stopped employing Gill, the doctor remained active. Last summer he gave testimony in a homicide case, a stabbing. Asked if he intended to continue working as a forensic pathologist and if he was seeking employment, Gill e-mailed back. "Yes and yes," he said. This investigation was reported and produced by staff at ProPublica, Frontline, NPR, the Investigative Reporting Program at UC Berkeley, and California Watch. Reporters Lowell Bergman, Andres Cediel and Carrie Lozano contributed reporting to this story.